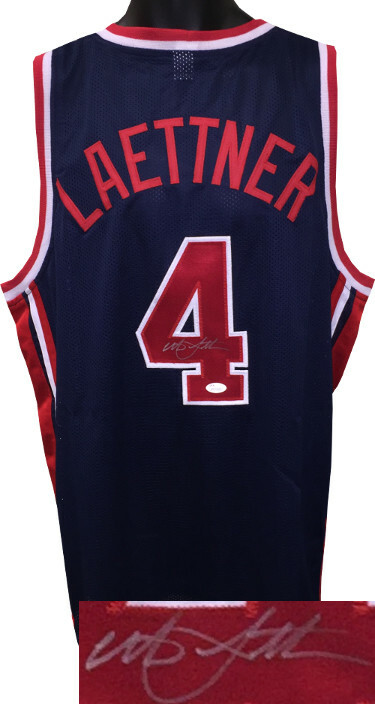 This is a new, in stock, Christian Laettner signed Team USA Navy/Red Trim Unlicensed Custom Stitched Basketball Jersey with fully stitched twill numbers on the front and back, there are NO LICENSED TEAM LOGOS, TAGS, BRAND NAMES or PATCHES ON THIS JERSEY & IS NOT AN AUTHENTIC OFFICIALLY LICENSED JERSEY, 100% polyester, made in the Philippines. Size XL (48/50). JSA Witnessed (in the presence) Hologram and Certificate of Authenticity.